To evaluate the effect of a specified treatment course with CES on fibromyalgia patients’ sleep quality, anxiety, depression, anger, tender point scores, self-rated pain, vigor, fatigue, confusion, feelings of well-being, and quality of life when compared to sham treatment under the same experimental conditions in subjects meeting the inclusion and exclusion criteria. An IRB approved 6 week study that included a 3 week randomized, sham treatment controlled, double-blind clinical trial arm followed by a 3 week open label crossover arm in which subjects in the sham and control groups could elect to participate in a treatment course of CES. The primary effectiveness endpoint in the RCT was the change from baseline in the last post-treatment self-rated scores on the 10 point Numerical Rating Scale (NRS) for overall pain, quality of sleep, feelings of well-being and quality of life, and Profile of Mood States (POMS) subscales compared to the sham treatment group at the end of week 3 of the study. The primary effectiveness endpoint in the open label crossover arm was the change from baseline in the last post-treatment scores on the 10 point Numerical Rating Scale (NRS) to post-test for overall pain, quality of sleep feelings of well-being and quality of life, and POMS subscales at the end of week 6 of the study. Effectiveness outcome measures were completed at the end of week 3 of the RCT study and at the end of the open label crossover arm 3 weeks later. • Male and female subjects with fibromyalgia ≥ 21 years of age. • Diagnosis of fibromyalgia was verified by a board certified rheumatologist using the criteria established by the American College of Rheumatology. • RCT arm: 3 weeks of treatment with either the active CES device or the sham device. Following the baseline tests, subjects were taught to use the CES device, and were instructed to use it every day for one hour over the 3 week period. At the end of 3 weeks, the subjects returned to the clinic, and outcome measures were repeated. • Open label crossover arm: At this time blinding was broken and subjects in the sham and control groups were given the option to receive active CES for 3 weeks. 23 of the 40 subjects in the sham group elected to participate in the open label crossover arm. Subjects used the CES device daily for 1 hour for 3 weeks. At the completion of the 3 week open label crossover arm, subjects were retested on study outcome measures. Subjects were randomly assigned into 3 separate groups, ether active CES at a subsenate level, sham group or control by drawing subjects names out of a container. The active CES device was set to 100 µA, a subsensory level. The sham device was identical in appearance to the active CES unit, but used ear clips made for this study that did not conduct an electrical current. The subjects, investigators, physicians and staff were all masked as to the identity of the device. The Profile of Moods (POMS) subscale A was used to measure anxiety and the POMS subscale D was used to measure depression. Sleep quality was measures by a 10 point numerical rating scale. All scales used have established reliability and validity (McNair et al., 2014, 1971; Farrar et al., 2008). A total of 60 subjects were enrolled, 58 females and 2 men ranging in age from 23 – 82 (M = 50) years of age. All 60 subjects completed the post-testing at the completion of the last treatment at the end of their week 3 visit. The average duration of symptoms was 11 years (range 1 – 40 years). Subjects were randomized to the active CES group (N=20), sham group (N=20) or a wait-in-line placebo control group (N=20). There was no statistically significant difference at baseline between active CES and sham treatment groups on any of the 12 outcome measures. The active CES group had significant findings on 8 of the 11 variables compared to the sham group: significantly lower anxiety scores (p=0.04, d = -.60), higher quality of sleep scores (p = 0.02,d = .45), lower pain scores (p = .004, d = .65), higher feelings of well-being scores (p = .007, d = .73), higher quality of life scores (p =.000, d = .97), lower fatigue scores (p = 0.03, d = -.72 and lower anger scores (p = 0.04, d = .60) compared to sham group (See Table 1). 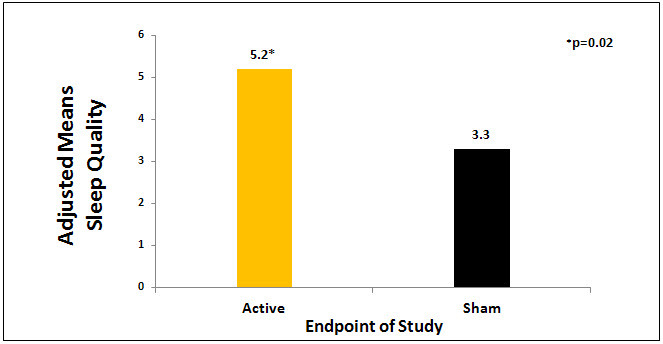 The treatment effect sizes between active CES and sham group ranged from -.36 to .97 on 8 significant variables, with a pooled effect size of .64. Table 1shows results of statistical analyses of outcome measures and Figures 1 and 2 show the results between groups in anxiety scores and sleep quality. Table 1. P-values for comparison between active CES and sham groups at week 3. After completion of the RCT arm, 23 of the 40 sham or control patients opted for actual CES in an open label crossover arm where they could increase the current in accordance with the standard clinical protocols for Alpha-Stim CES. Data were analyzed with repeated measures analysis of covariance variance, with least significant difference a posteriori testing. Table 7 shows results of statistical analyses of outcome measures at week 6. Table 2. P-Values for changes from baseline to post-test within open label crossover group at week 6. 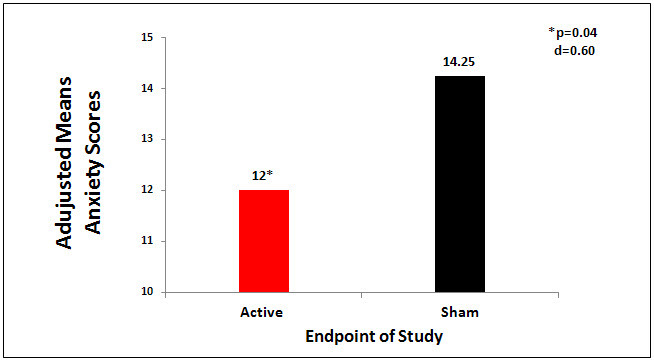 Strengths of this study are: use of a randomized, sham controlled, double-blind design (the investigators chose to use the Alpha-Stim RCT research protocol for the study); active and sham Alpha-Stim devices were pre-set and locked at the designated levels for each specific group for current level and time by the manufacturer at the factory and sham units were the same as active units, except they did not emit electricity; randomization of devices was done by the manufacturer and followed according to the protocol by the investigators; use of 3 groups, active sham and the control group; and the structured and detailed protocol for the CES treatments for both active and sham groups. A limitation of the original data analysis is that it used analysis of variance (ANOVA) and no within or between group effect sizes were included. In the 2011 reanalysis of the data, analysis of covariance (ANCOVA) was used to provide a more comprehensive description of the findings. The Profile of Mood States (POMS) subscales were used to measure anxiety and depression. This was a common approach in the late 1990s and early 2000s. Today, the Hamilton Anxiety Rating Scale or similar rating scale that focuses entirely on the anxiety would most likely be used. The same is true for measuring the variable of depression. The effect of CES on depression was not significant in this study in contrast to the findings of other Alpha-Stim studies on depression. One possible explanation for this finding is the use of the POMS subscale on depression, whereas other studies used scales that focused specifically on depression, such as the Hamilton Depression Rating Scale. The findings for anxiety and sleep quality in this study are consistent with the findings of other Alpha-Stim studies that found CES significantly decreases anxiety and improves sleep quality.